The American public increasingly has been looking inward after years of economic stress at home and a decade of wars abroad. But while Americans are putting a lower priority on foreign issues and a higher one on dealing with problems at home, they have a keen awareness of the challenges posed to the U.S. by China in the superpower competition between the two countries. This is a pivotal time for China with the top leaders of the Communist Party set to gather later this week for the Third Plenum of the 18th Party Congress, a gathering expected to focus on economic reforms. Unlike 20 years ago, American public now looks to Asia—rather than to Europe—as the region of the world most important to U.S. interests. 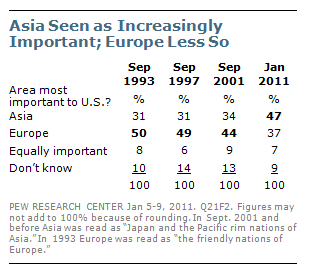 In a January 2011 survey, 47% said Asia was the most important to American interests compared to 37% who cited Europe. Questioned in recent years about their interest in news from various countries, more Americans (34%) say they are very interested in news from China, more so than news from France (6%), Germany (11%), Italy (11%) and even Britain (17%). The attention to China is not academic. Pew Research surveys have found that publics around the world believe the balance of power behind the U.S. and China is tipping to China. Americans are evenly divided when it comes to that judgment — 47% believe China will or has already replaced the U.S. as the leading global superpower, while 47% think that will not come to pass. By a small margin (44% to 39%), more name China than the U.S. as the world’s leading economic power. Most Americans still believe that the U.S. remains more powerful militarily than China. And by a wide margin — 59% to 28% — they believe that China’s economic strength poses more of a challenge to the U.S. than its military potential. There is little doubt that these trends have contributed to increased unease about China as a commercial competitor, especially coming at a period of still-difficult times for the American middle class. Americans are aware that China is the country that holds the most American debt. (A Pew Research Fact Tank post reported that, as of July, China’s Treasury holdings amount to about $1.28 trillion, or 7.6% of the total U.S. debt). And Americans are wary of China’s trading policies. Nearly eight-in-ten Americans (78%) consider the large amount of American debt held by China to be a very serious problem for the U.S., 71% say the same about the loss of jobs to China and 61% express serious concern about the U.S.-China trade deficit. While most welcome increased trade with other major nations, Americans have been divided about trade with China. In an October 2012 survey, more Americans (49%) favored getting tough with China on economic and trade policy than those who wanted stronger relations with China (42%). That was a turnaround from March 2011 when, by a 53% to 40% margin, the public said building a stronger relationship was more important than getting tougher with China on economic issues. Given American concern about the U.S. trade deficit with China and Beijing’s holding of American debt, the overall image of China in the U.S. has slipped somewhat in recent years. In just the past two years, the share of Americans who regard China favorably has fallen 14 percentage points (51% to 37%). Similar trends have occurred among publics of major Euro countries. 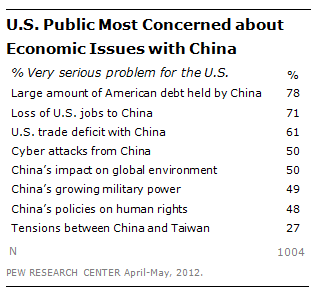 On the positive side, most Americans do not see China as an enemy, notwithstanding the concerns on the economic front. Only 22% of Americans view China as an adversary while 43% say China is a serious problem to be dealt with, but is not an adversary. Partisans differ when it comes to choosing between the policy priorities of building a stronger relationship with China or getting tougher on economic issues. About six-in-ten (59%) Democrats and independents are more willing to favor building a stronger relationship with China compared to 48% of Republicans. Nearly seven-in-ten Republicans (68%) favor getting tougher with China on economic policy compared to 53% of Democrats and independents. Surveys in the U.S. and China may speak well for future relations between the two countries. Young Americans (those under 30 compared to those over 30) are more amenable to the idea of putting the priority on building a strong relationship with China, with 71% saying it is very important. And, they look at China more favorably overall – 57% of 18-to-29 year olds have a positive view of China compared to 27% of those over 50. Young Chinese return the compliment. Half of those in China 18-to-29 years old have a favorable view of the U.S., compared to 27% of those over 50.